Welcome to Haddington Hire Centre Ltd. 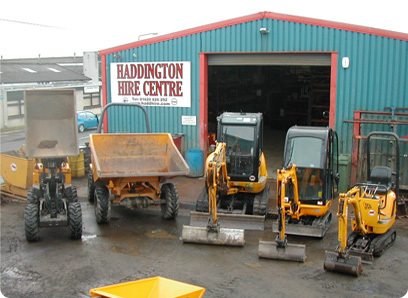 Established in 2001, Haddington Hire Centre Ltd, is a family run business with an emphasis on quality hire products with competitive rates and excellent service. We are constantly updating our hire products, expanding the range and improving customer service. We offer discounts for long term hire and also offer day hire on most items. Both trade customers and the general public are welcome. A new customer must provide 2 current trade references and a bank reference. All customers will be charged a deposit. This may vary on the item(s) of plant hired. Suitable identification must also be provided. Cheques will only be accepted with a banker's card. All major credit cards accepted. A cleaning charge will be made for equipment returned in dirty condition. Any loss or damage will be charged accordingly. Fair wear and tear and breakdowns due to normal use are naturally excluded. Inc. Abrasive Discs, Drill Bits, Sand Paper, Fixings, Nail-Cartridges, Diamond Blades, Diamond Cores and many more items available. Note: The checking of oil, water, replenishing of fuel is the hirer's responsibility. Our hire rates do not include delivery or collection. An extra charge will apply. Are available for all plant. Note: All prices are exclusive of VAT. In the interest of safety we advise that suitable protective clothing is worn by the hirer, i.e. Face Masks, Goggles, Ear Protection as required by statutory regulations. Our staff will advise accordingly.